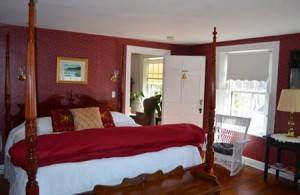 This lovely Bed and Breakfast is a circa 1820 Federal-style home overlooking the Kennebec River in the historic “City of Ships”, just a few blocks from the heart of town. This classic New England house features an elegant double staircase, wide pine floors and fireplaces. Guests can choose from three rooms. There is an inviting parlor area for guests to relax in and a dining room where the most delicious breakfasts are served! 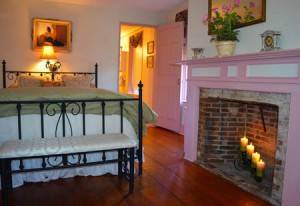 All three rooms at the Pryor House B & B are distinctly decorated. Keeping comfort in mind, all the while retaining some of the 1820’s features. Immaculately cleaned, all with private baths, cable, and wi-fi. Rooms include hair dryers, clock radios, and air conditioning, iron/ironing board is available upon request. 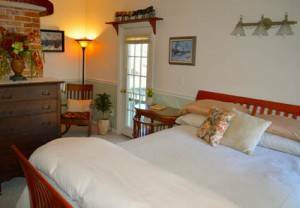 The largest bedroom with a king-size four poster bed, it is the only room that has a view of the Kennebec River. Click here for more information. Named for a previous innkeeper, Elizabeth, this queen-size pillow top bed has a large ensuite bathroom. Click here for more information. The warmth and coziness of this room with queen-size bed, along with it’s own two-person jacuzzi and outdoor balcony is the perfect place for a private getaway. Click here for more information.